Die deutsche Mannschaft ist ausgeschieden, aber die WM geht weiter: Fakten, Fans und Stars – zur Fußball-Weltmeisterschaft 2018 zeigen wir einige Aspekte deutscher Fußballkultur. Und in unserem Quiz können Fußballphilosophen und Teilzeit-Fans ihr Wissen testen. Black, red and gold as far as the eye can see: football fans at Berlin's Fan Fest for the 2018 World Cup. After decades of a shadowy existence, the black, red and gold of the German flag have become standards signs of national pride at events like the Football World Cup. But fears are also growing that a new wave of nationalism may emerge from the shadows as well. 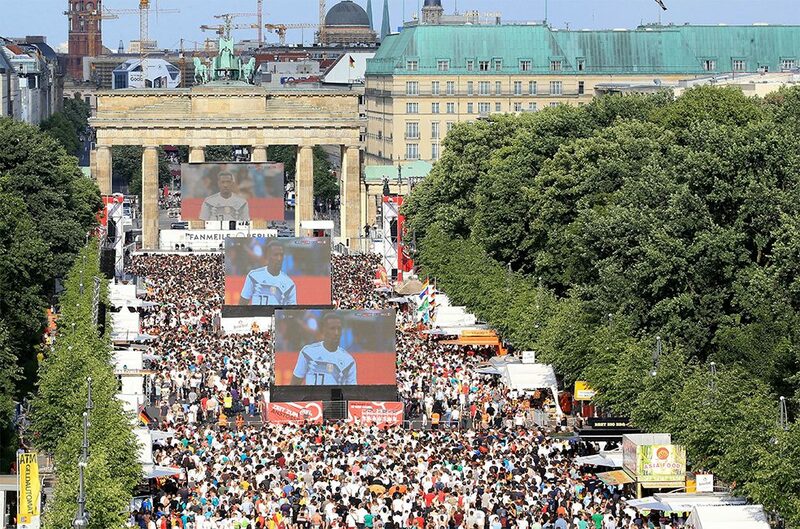 June 2018: Tens of thousands of hopeful football supporters gather at Fan Fest Berlin to root for the German national team in its first match at the World Cup in Russia. The crowd in front of Brandenburg Gate is awash in Germany’s national colours. Fans sport caps, scarves, sweatbands, seat cushions and other paraphernalia in black, red and gold, keen to display their allegiance with the national team. Some cars even boast side-mirror covers in the national colours, and flags flutter wildly throughout the country. The positive media coverage of the national colours’ 2006 comeback ended this restrained approach, and masses of fans donned the black, red and gold with increasing confidence. “Many saw it as a liberation,” sociologist Schediwy recalls. Younger fans in particular wanted to celebrate as a nation without the crushing weight of Germany’s national-socialist patriotic past. To them, German flags and the national colours painted on faces or emblazoned on clothing symbolized nothing more than the feeling of solidarity with their football team other countries take for granted. Whether as face paint, on a T-shirt, or as a handheld flag: Since 2006, most football fans wouldn’t dream of cheering on their team without the black, red and gold. | Photo (detail): © picture alliance / Abdulhamid Hosbas / AA Flying the flag and wearing the national colours has since become the norm in Germany, though there has been some backlash. Many denounced this new trend in the run up to the 2018 World Cup, which experts attribute in part to the emergence of right-wing populist movements. Demonstrators at rallies organised by the "Patriotic Europeans against the Islamization of the West" (Pegida) alliance and the "Alternative for Germany" (AfD) party, which won some seats in the German Bundestag in 2017, enthusiastically wave the German flag along with their party flag. The AfD fan shop sells stickers and posters that feature the black, red and gold. The debate on what Germany’s national colours symbolize is in full swing. In June 2018, Vice President of the German Bundestag Claudia Roth warned of an emerging wave of nationalism. And while she didn’t want to forbid anyone from flying the flag, the Green politician said, "I think as Germans, we would do well to show restraint with nationalistic, self-congratulatory displays.” She emphasised that the AfD in particular were instrumentalising the German flag to signal exclusion. Political scientist Stefan Marschall has a very different take on the issue. He is confident that keeping the German flag flying in a wide range of contexts could prevent it from being "appropriated and exploited for other ideas". 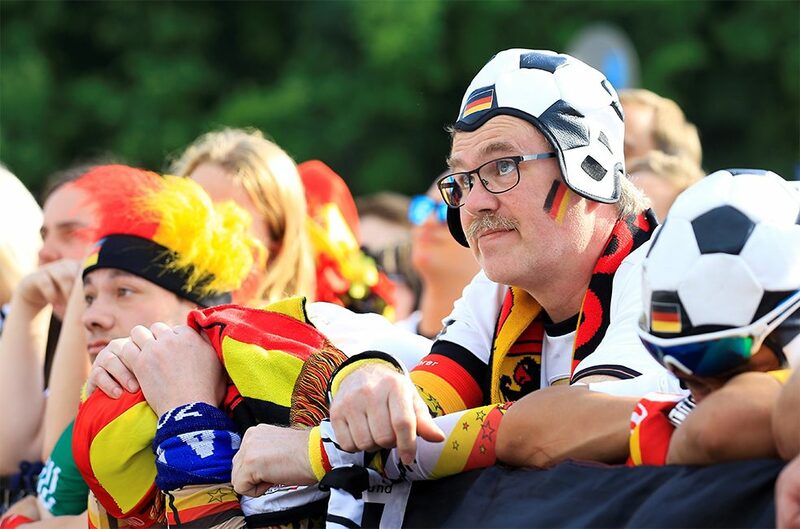 For many football fans, wearing Germany’s national colours is just part of the fun and has nothing to do with xenophobia or exclusion - but criticism is growing. | Photo (detail): © picture alliance / Abdulhamid Hosbas / AA The sense of lightness and ease from the 2006 World Cup has vanished, and we can no longer take such a relaxed, carefree approach to national symbols– for the most part at least. 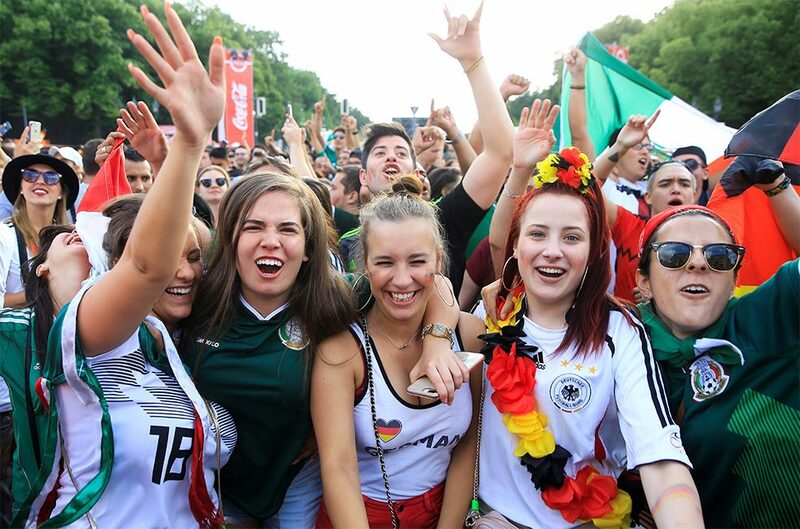 Besides, many German football fans also have other favourites among the nations participating in this year’s World Cup. This multi-cultural Germany is evident in importer Promex’s sales figures. The company reports that while the German flag is the top seller at 27 percent, scarves in the national colours of countries like Switzerland, Russia, Poland, Iceland and France are also in demand, and one in fifty customers apparently plans to cheer on far-off Australia. Wolfgang Mulke works in Berlin as a freelance correspondent for a range of newspapers on social, economic, ecological and consumer policy issues. Text: Goethe-Institut, Wolfgang Mulke. This work is licensed under a Creative Commons Attribution – Share Alike 3.0 Germany license.